No Thing is not nothing! This entry was posted in Art, Imagination, Philosophy, photography, Poetry and tagged Dreaming, Photoshop. Bookmark the permalink. Nothing is an interesting topic ??? Yes. We could talk about nothing for a lifetime and still not know No Thing. The inanimate is god…and the animate is the offspring…deep and truthful piece! Searching for and fearfully running from….at the same time, not realizing. Wow – this is an awesome poem!! I was reading through your website. I think the super is hidden within the fragile of all of us. Wow – so well put!! 🙂 Nice to meet you too… Look forward to reading your blog. I’m not sure how you did it but I love the photo. Secondly I love the poem and blog. 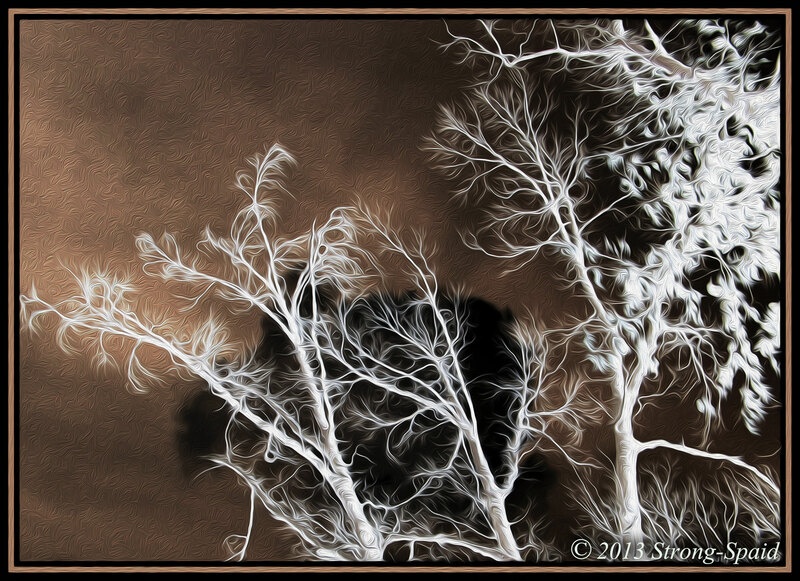 Every once in a while, I will throw a photo into inverse (negative mode) using Adobe Photoshop. So that everything becomes the opposite of what it once was. Light becomes dark; white becomes black….rather unreal in appearance, like images from a dream. I suspected APS. I love it regardless of how you did it. It would be in my opinion a frame-able piece of work. Hahaha…the nuns told me the no thing was Buddhist. and you said ‘ nothing ‘. No Thing is always present, everywhere. Fear keeps us from knowing. And so we continue to search on a pathless path…..for what we never lost, and are afraid to find. Well done. 🙂 Reminded me stylistically of “anyone lived in a pretty how town”. Intriguing image. Very effective combination of image with verse. Thanks for visiting my blog. I have experimented with the poetry forms of Fibku & hyper-linked found poems, If you are interested, you can find some these experiments on my blog under the poetry tag. A real mind-bending forest of word play. Very interesting to read. I will look at your poetry. I have never heard of Fibku before.